Hi friends! It’s panning out to be a busy week, lots of fun projects, meetings/phone calls are lined up. After a sluggish month, I definitely welcome back the fast paced schedule! Taking a breather and just finished eating the leftover Tonkatsu and cucumber salad from last night’s dinner, you know they are great recipes when the leftover taste good also! What is your go-to recipe for a fast week night family meal? I love planning ahead and make crock pot dishes, pork or beef stew for noodles are a must. Rarely when there’s good steak on sale, I would pan grill them, with a side dish of vegetable, dinner can be ready in 15-20 minutes! Last night I was in need of a new quick dinner recipe, with the fresh pork chops and crisp mini cucumbers starring at me, Just One Cookbook’s Tonkatsu post came into my mind. Am I glad to have given it a try, wow the pork chops turned out absolutely tender and juicy, the crust was crunchy and delicious, this is something that will certainly be a stable in my house! 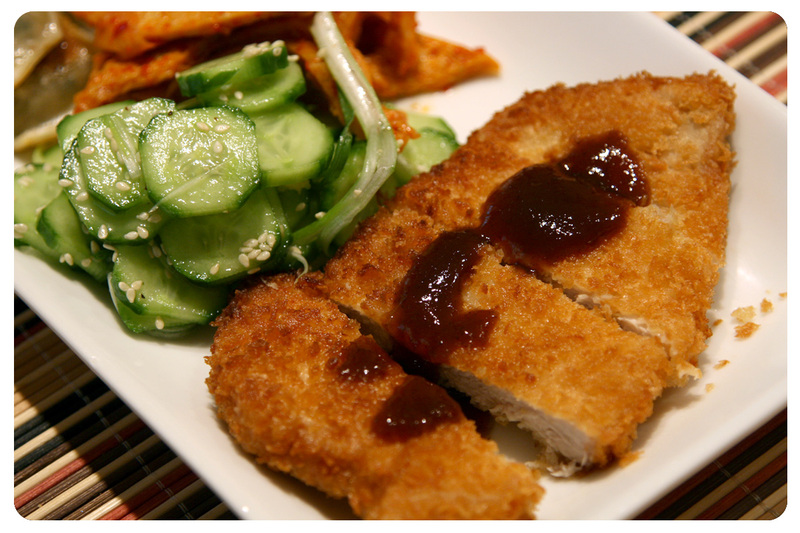 Here is the link to Just One Cookbook’s Tonkatsu recipe, enjoy! To balance out the fried pork chop, I thought a refreshing cucumber salad would be ideal, the family raved about this vegetable side dish, and it hardly took any efforts at all, hopefully you will give it a try! Using a sharp knife, cut the cucumber into 1/8-inch slices. Transfer to a colander, sprinkle with the 1/2 tsp. salt and let stand for 10 minutes. Drain the juice. In a small bowl, whisk together the vinegar, sugar, mirin and sesame oil. In another bowl, combine the cucumber, scallions and sesame seeds. Add the vinaigrette and stir to combine. Season with salt and pepper. Serve the salad chilled. Ahhh Nami, that’s so exciting! I love that your family and I are having the same dinner this week! I still can’t get over how tender and juicy the pork chops turned out, must be the double frying? The only problem is I forgot to put salt on them, since Jon is not a fan of the katsu sauce I bought, his Tankatsu was probably a bit bland… Trini and I used the sauce and chops were wonderful! Hope you like the cucumber salad recipe, the original didn’t call for mirin, but I think it needed more sweetness and mirin did just that! Yes we LOVED it!! I think your judgement was right. I love that you added mirin and I also followed your recipe. It’s going to be a repeat recipe for us!! Thanks for sharing! Yay Nami, glad you liked the recipe! I adore pork chops. I have promised myself that Tonkatsu before, but we were on a low-cal diet (for my husband’s diabetes), so never got round to it. And I especially love cucumber salad. We have tzaziki a lot, but this looks like a really nice accompaniment to almost anything, so I’m inspired now! Hi Jenny! I looked up tzaziji, don’t think I’ve had a proper one, though definitely tzaziji sauce on top of gyros, yum! I don’t think we are suppose to eat Tonkatsu often either, definitely not good for the waistline! Jeno, your tonkatsu looks so perfect! Golden brown outside and juicy inside… Do you realise you have just presented one of my favourite dishes and paired it with my favourite vegetable? 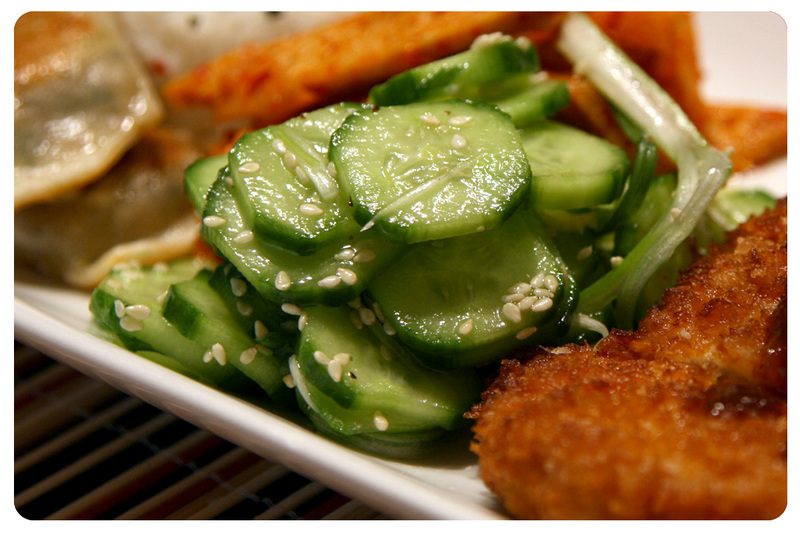 The cucumber salad sounds delicious too and there are even sesame seeds! (I sprinkle sesame seeds on almost everything!). Now I know what will be my next buy at the butcher’s and what dish we will certainly have this weekend. I am already hungry! Hi Sissi! Thank you so much! Looks like you and Nami and I now have the same favorite food combination! I definitely thought of you while pouring the sesame seeds, we don’t use them enough in my cooking! Jeno, this meal looks absolutely delicious! I love the freshness of your simple cucumber salad, too. I’d love to try it one of these days with Nami’s tonkatsu. Great recipes, thanks for sharing! Thank you Georgia! Growing up the cucumber salad was a stable, though never a favorite dish of mine. The funny thing is my family really enjoys it, so it will definitely get many repeat performances! That kontatsu looks so perfectly fried, I like how your serve the fried pork with the cucumber salad – such a great balance. I made some congee today so the cucumber would serve a great side dish 🙂 Thanks for sharing. Hi Yi! Too bad you didn’t find any cucumbers in the fridge, I don’t usually have access to those mini cucumbers, just went to the Vietnamese market and they had the big American ones, but not the little Japanese ones. darn!